Del Webb at Cane Bay is a charming active adult community 25 miles northwest of historic Charleston, SC. Elegant homes, inviting front porches, and friendly neighbors capture the essence of southern living at its best. A large clubhouse and active lifestyle make this the community you have dreamed about. 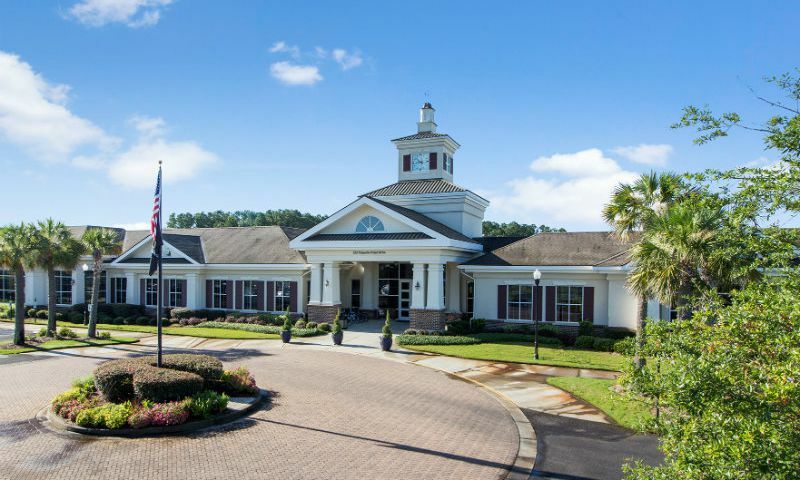 This 55+ community is spread across 360 beautifully manicured acres complete with blooming azaleas, preserved wetland, and impeccably landscaped terrain. The sandy beaches, recreation, and culture of Charleston is just a short drive away but with everything Del Webb in Summerville has to offer, you might never feel the need to leave. World-class amenities, fitness classes, and an abundance of social activity have drawn retirees from all corners of the country. Upon completion, Del Webb at Cane Bay will have 1,000 homes, providing ample opportunity to find new friends and meet other like-minded individuals. The Resort is a 20,000 square-foot clubhouse and recreation area that serves as the center of all community social and fitness activities. The facility includes a state-of-the-art fitness center with the latest high-end cardiovascular and weight training equipment. There is also an indoor lap pool, aerobics studio, hobby and craft studios, a ballroom, and a sundeck. Surrounding the Resort are an enviable lineup of amenities that include an outdoor resort-style pool with beach entry, a fishing lake, dog park, tennis, pickleball, and bocce ball courts. An event lawn hosts great entertainment such as guest speakers and nighttime concerts. Plus, there are miles of scenic walking and biking trails that meander through the community. The homes in this 55+ community are designed with the needs of active adults in mind. Large, spacious great rooms, open kitchens, front porches, and elegant finishes are included on many of the homes. Del Webb started the community in 2007 and built 1,000 homes. Home in Del Webb at Cane Bay are available on a resale-only basis. The homes in Del Webb at Cane Bay are among the most reasonably priced of any Del Webb active adult community along the east coast. There are six model collections offered: Passport, Expedition, Pinnacle, Seaside, Harbor, and Coastal. These homes offer between 1,109 and 2,722 square feet of living space. Homebuyers can construct the home of their dreams that has one to four bedrooms, one-and-a-half to four bathrooms, and an attached garage. In this active adult community, lifestyle takes center stage. Whether you are interested in taking up an old hobby or starting a new one, there are endless opportunities. A community activities director is continually providing residents with new and exciting social activities, community events, and fitness classes. There are several dozen clubs and interest groups that meet on a regular basis that include fun groups such as card clubs, scrapbooking, golf, line dancing, photography, wine tasting, and much more. This 55+ community also promotes continuing education for its residents. The Resort includes a variety of resources for learning, and meeting and socializing with other residents who wish to pursue continuing education. Multi-purpose rooms in the clubhouse host workshops, classes, club meetings, and more. Plus, the nearby Trident Technical College in North Charleston offers an extensive list of continuing education classes in everything from interior decorating to real estate and culinary classes. Del Webb at Cane Bay is surrounded by an exciting mix of shopping, dining, recreation, and culture venues. Charleston is rich in history and several museums such as the Charleston Museum and the Patriots Point Naval & Maritime Museum are exciting destinations. Plus, the largest historic district in the country is in Charleston where blocks of historic homes, museums, and plantations line the streets. Other places like the South Carolina Aquarium and Fort Sumter are also nearby. There are several hospitals close to the community, including Roper Hospital, Trident Health System, and Summerville Medical Center. The Charleston Airport is only 20 minutes from Del Webb at Cane Bay and there are several great shopping destinations between Summerville and Charleston. Recreational enthusiasts are only 30 minutes from the beach and the Francis Marion National Forest, which is north of Charleston is great for camping, hiking, biking, and horseback riding. Just 45 minutes north of Del Webb at Cane Bay are Lake Marion and Lake Moultrie, which are large man-made lakes that are ideal for boating and fishing. When looking for an active adult community in South Carolina, 55+ homebuyers should look no further than the top-notch Del Webb at Cane Bay. Resort Clubhouse - 20,000 Sq. Ft. There are plenty of activities available in Del Webb at Cane Bay. Here is a sample of some of the clubs, activities and classes offered here. The Passport Collection offers homes that have between 1,109 to 1,424 square feet of living space. These homes offer one to three bedrooms, one-and-a-half to three bathrooms, and an attached two-car garage. The Seaside Collection offers three models available on a resale-only basis. Homebuyers can find one of these three floor plans that offers between 1,244 and 1,414 square feet in size. These homes were built with two bedrooms, two bathrooms, and an attached two-car garage. The Harbor Collection offers resale homes that range in size from 1,590 to 2,722 square feet. Five models were offered and have two to four bedrooms, two or three bathrooms, and an attached two or three-car garage. The Expedition Collection offers four models. These homes are between 1,656 and 1,961 square feet in size. Homebuyers can find a home that has two or three bedrooms, two or three bathrooms, and an attached two or two-and-a-half car garage. The Coastal Collection contains three models available on a resale-only basis. They range in size from 2,051 to 2,597 square feet. These homes were built with two to three bedrooms and bathrooms as well as an attached two or two-and-a-half car garage. The Pinnacle Collection offers the largest homes with 2,411 to 2,565 square feet. These homes offer two to four bedrooms and bathrooms. They also include an attached two or two-and-a-half car garage. Great weather. Very social. Tons of amenities. Friendly community. Lots of,social,activites. Beautiful homes. My husband and I have been in Del Webb Charleston for just over a month. We like it here very much. The people are all very friendly. Just in the first week, we received three dinner invitations! There are plenty of activities, and upon joining, people are very welcoming. The new Publix grocery store is very conveniently located. Other stores are a bit of a drive so that when you leave here, you should plan to be out for awhile, but there is a pretty good cross section that provides most everything you'll need. In terms of location, being near Charleston is a plus. That city definitely has personality and being close to the beach is great, too. We looked around for about three years. In terms of other Del Webbs in SC, this one is smaller, but we like that. Prices of homes when we bought gave much more bang for the buck here than in other SC Del Webb communities. We're still adjusting, of course, but thus far, we feel we made the right decision in moving to Del Webb Charleston. Fantastic community, so much to do if you care to. Amenities are wonderful pools, fitness center, tennis, pickle ball and so much more. Can't say enough one has to experience for themselves. We're looking at building the Tifton Walk plan with the 2nd floor loft. We've looked at the pricing for some of the extras we like and we feel ok with the final price. I would rather start with a lower base price and add in only the things we really want vs. spend money on things that are not that important to us. We love the clubhouse and all the amenities. We're excited to build our home here! June 21, 2013: Just returned from SC and spending hours at Del Webb. We looked at 7 fully furnished complete homes(different sq footprints and styles) adjacent the Visitors Center. We also looked at 10 homes in various stages of completion. We viewed 10 lots available for purchase. Very impressive organization, clubhouse and planned community. The basic cost is THE BASIC and everything else is an "upgrade" for an additional fee. Even the lot to build on is an upgradable fee of $10-20,000. HOA cost reasonable. Building 40 homes last week with a 4.5mo window for occupancy. Only selected lots have been released for sale. We checked this place out a few months ago. It is way, way off the beaten track; seemingly far from Charleston and at the very back of a planned community that apparently was hard hit by the economic downturn. Eventually it will probably be fine but at the time we visited there were no models to show us and what we did see as new construction had a long way to go to being updated 2012 desired homes. 55places.com is not affiliated with the developer(s) or homeowners association of Del Webb at Cane Bay. The information you submit is distributed to a 55places.com Partner Agent, who is a licensed real estate agent. The information regarding Del Webb at Cane Bay has not been verified or approved by the developer or homeowners association. Please verify all information prior to purchasing. 55places.com is not responsible for any errors regarding the information displayed on this website.